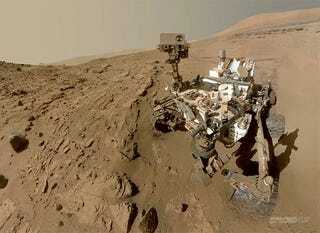 Why has Curiosity slowed down its course during its first Mars year? The Mars Curiosity Rover has completed its first Mars year in the Red Planet—687 Earth days exploring and drilling on its way to its first destination—Murray Buttes. Overall, it's been a Mars year full of successes, even if we haven't found proof of life in Mars yet. But the rover has slowed down significantly. Why? Engineers at the Jet Propulsion Laboratory are worried about wheel damage, which has been worse than expected. According to NASA, the damage has "prompted a slow-down in driving late in 2013, the mission team has adjusted routes and driving methods to reduce the rate of damage." Here's the complete map of its progress through the surface of the Red Planet.